An upcoming art show of 40 quilts, honouring 40 years of friendship, brings a powerful message and seeks to raise funds for cancer organizations. 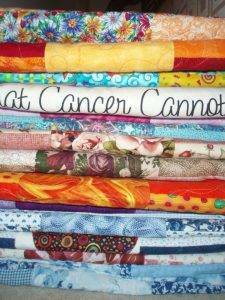 Hundreds of people affected and impacted by cancer will benefit from the proceeds of a show of 40 quilts which will then be distributed to over a dozen cancer organizations for fundraising purposes. The quilt show, which opens Saturday, March 28 from 4 to 6 p.m. at Sawyer Sewing Centre, runs throughout the month of April. The show honours organizer Nancy Martens’ best friend, Jeanne Coverdale, who died of metastatic breast cancer in September 2011. “Making these quilts, with Jeanne in my heart, was therapeutic and helped me deal with my grief,” said Martens, who made 17 of the 40 quilts. “After giving seven quilts away to different people as fundraising projects for various cancer organizations, I saw how successful they were and so decided to make 40 quilts representing the number of years Jeanne and I were friends. News of Martens’ project spread and she started receiving quilts from all over North America – including Wisconsin, Iowa, and Ottawa and from a woman who quilted while working in a lighthouse off the coast of B.C. It soon became apparent that Martens wouldn’t have to sew them all herself. As quilts were completed or arrived in Martens’ mail she showed them to friends who suggested she have a quilt show featuring all 40 quilts before distributing them as fundraisers. Quilting played a major role in Jeanne Coverdale’s life. In 1993, she founded a quilting business, Block Party Studios, and when she was diagnosed with breast cancer in 2010, her local quilting community made her a beautiful quilt infused with their love. It kept her warm during her chemo sessions. Because it was so large, the quilt sometimes proved problematic for Coverdale’s nurses. 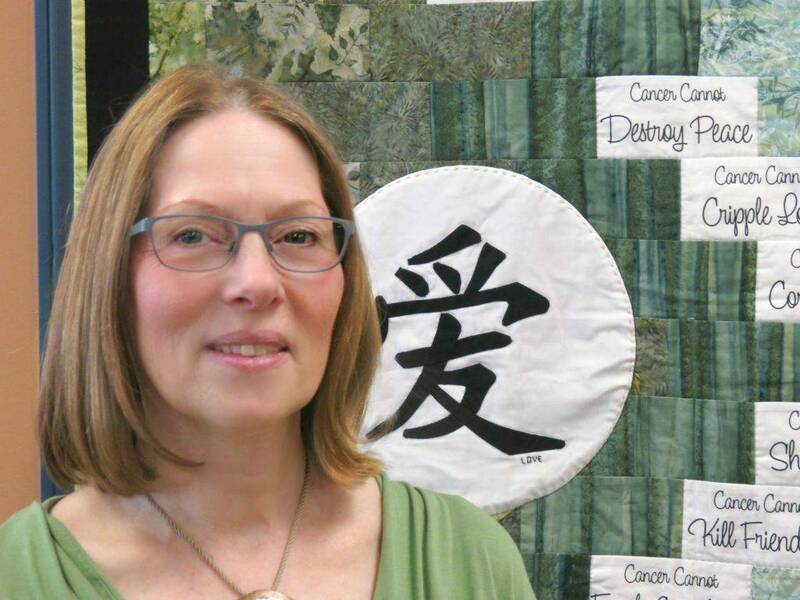 So she designed her own printed quilt panel, called “What Cancer Cannot Do,” an adaptation from the poem, “Cancer Is So Limited.” The words of Coverdale’s poem are on the 40 quilts. Among the organizations which will receive quilts from the show are the B.C. Cancer Foundation, the Canadian Cancer Society, Cops for Cancer, Camp Goodtimes, Island Breaststrokers, Ovarian Cancer Canada, the Prostate Centre, Team4Hope, the Terry Fox Foundation, the Breast Cancer Research Foundation (Run for the Cure), and the Prostate Cancer Foundation B.C.